The single biggest reason that social selling adoption is failing in organizations is because of the frontline sales managers. There's a host of other problems, which I'll go through, but they are the single biggest barrier to entry of new ideas and innovation. Sales leaders forget how important they appear as “superheroes,” people that sales reps want to emulate. Think about it: You're a 25-year-old sales professional, or a 35-year-old sales professional. You look up to your manager. Your manager was you at one point. Almost all sales managers were once quota-carrying sales people that were very successful and promoted to be leaders. Sales teams looks up to their leaders and say, I want to do what made you successful. You have blazed a path to management, and I want to blaze that same path. Sales teams use the things you've done in the past and what you will do in the future as a guide for their current sales behaviors. Everything you do causes a ripple effect. And social selling program failure is just the tip of the iceberg. The problem goes deeper than that. I can always tell a social selling program is set for failure by the way the sales kickoff plays out. Here are the top red flags I look for. Sales trainer for inside sales Art Sobczak says, “I know that the program’s going to be a failure when they've spent more on the bagels than they did on my speaking fees.” I wholly agree with this. It’s a strong indicator of where their priorities lie. I've always taken that to heart ever since. At these events, I can tell right away if their priority lies on glitz and glamour or product features, rather than on skill based training, innovation, thought leadership and truly moving the needle outside of their own little bubble. I come in and notice not only the extravagance, but also the way that the sales leadership has been proofed or addressed on who’s coming into the room. So for example, if I'm coming in as a guest, and the sales leaders didn't know I'm coming, who I am or what topics I’m speaking on, that’s an immediate red flag. You can tell right away that on a pecking order of skill based training or innovation, they're just not there. At some sales kick offs, it's three days of being blasted with knowledge—7:30, 8:00 am starts until 5:00 pm, 30-minute, 60-minute, 90-minute workshops, barely a breather in between. Topics are going all over the map. Tons of food, tons of drinking, tons of partying. Great. The problem is, none of the knowledge is retained. If there's an overemphasis on partying rather than knowledge-absorption, I know management isn't serious about starting off a new initiative. There's all kinds of stuff for the reps, but nobody is actually managing the managers. Nobody’s giving skill-based training to the leaders, because it's assumed they must know what they're doing. They were successful salespeople, now they're in a leadership role. But very much like a sales professional, when they become leaders, like a new hire, they're infant leaders. They have to learn over the next 5 to 10 years how to refine, how to communicate, what to measure, how to create accountability. How to look for green and red flags in activity levels and then be able to coach towards that. How to motivate, how to hire and fire, all of those things. None of that I've ever seen at a sales kickoff agenda. It’s too filled with product-based information, sprinkled with a bit of knowledge based information for sales professionals. Often the leaders just sit there. Sometimes they even have a breakout at the same time the sales reps are going through skill based training. So the leaders aren't learning the same topics that the sales reps are! If we were to really pinpoint the root cause when a customer had failed to adopt social selling, it was buy-in from the leadership team. Without buy-in, your reps aren’t accountable to drive the right activity to make meaningful impact. There are a variety of reasons why leaders don’t buy in, but at the end of the day, these leaders were just unwilling to change, or most importantly, unwilling to create accountability. They manage by spreadsheets. They just look at numbers and they say, come on Johnny, you can do it. Or, why didn't you make your numbers? But there's no coaching. There are two books I find incredible for leaders looking to learn more—one very different than the other. 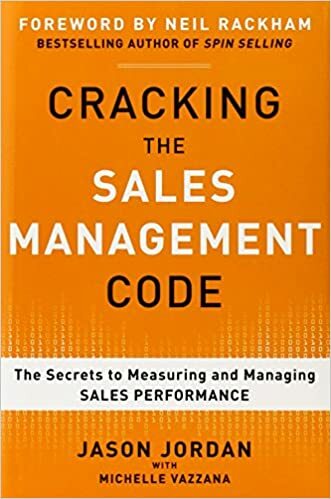 Cracking the Sales Management Code by Jason Jordan teaches leaders to think about where they want to get to, and they reverse engineer the type of activity that influences the type of objectives they want to hit that ultimately align to the type of results they want to achieve long-term. It's a book about teaching you how to lead by the things you can control, the activities. 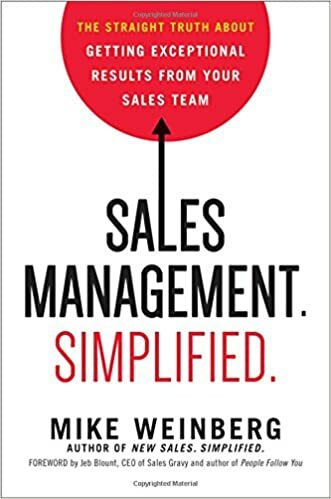 Sales Management Simplified by Mike Weinberg is a deep dive into the tactics behind the coaching one-on-one. Now, you're in the room with leader and rep. What should the leader be looking for? Green flags, red flags. What should they coach you towards? How should they be leading with a carrot versus a stick? All the best practices of the active coach. I think those two books can really help people move forward.